Earlier this week, we reviewed the latest version of Kaspersky Pure security suite for Windows. Kaspersky Pure combines all latest technologies to secure your PC, your online presence, and your passwords from threats. With so many features in one software, it’s easily the best security solution available to secure your PC. A 30-day trial copy of the software is also available from the official page. Many of you might already have tried it and even purchased license. And those of you want to stick with other free antivirus software even after trying this powerful security software may like to completely uninstall Kaspersky Pure from your PC. 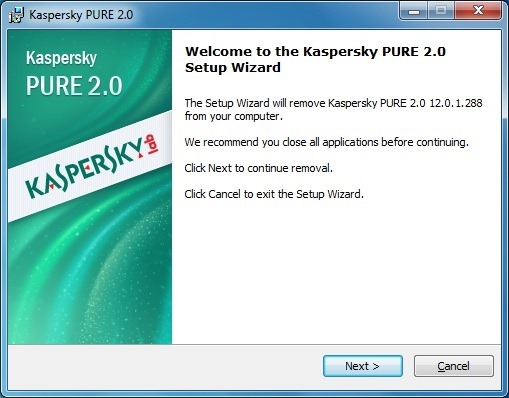 In this guide, we will show you how to remove Kaspersky Pure. There are two ways to uninstall Kaspersky Pure. The first method involves using the official Kaspersky Lab Products Remover tool and second one is to use the Kaspersky Pure’s own uninstaller. Step 1: Download Kaspersky Lab Products Remover zip file from here. Extract the zip to get kavremover.exe file. Step 2: Double-click on kavremover.exe file to run the tool. 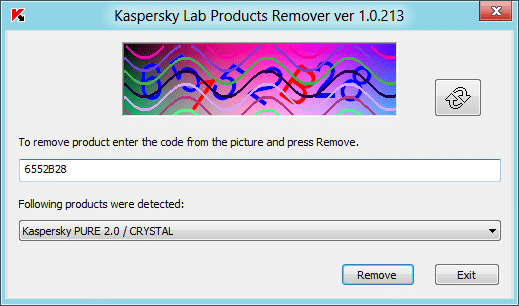 You will see Kaspersky Pure 2.0 /Crystal under Following products were detected drop-down menu. If you can’t see the Kaspersky Pure entry, use the refresh or reload button present on the tool. Step 3: To begin uninstalling the product, you need to enter the code that appears on the picture before clicking Remove button. Once the tool finishes its business, you will be asked to reboot your system. You are done! Method 2: Use this if you have installed Kaspersky Pure on Windows 7 or Vista. Step 1: Go to Start menu, all programs and find Kaspersky folder. 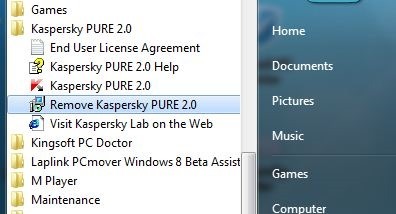 Under Kaspersky folder, you will see Remove Kaspersky Pure option. Click on it launch uninstallation wizard. Step 2: Click Next button and specify the objects that should be saved or removed along with the software. Click Next button and finally click Remove button to begin uninstalling Kaspersky Pure. Once done, you will be asked to reboot your PC. You might also like to download Kaspersky Internet Security 2013 for Windows 8.